The history of Zi Sha Hu has started at Yi Xing during 正徳 (1506-1521) to 嘉靖 (1522-1566) in Ming dynasty. The tea pot was needed since the tea culture was changing to the modern style at that time. It was more than 500 years after陸羽・LuYu（733～804）introduced 茶経. In Japan, tea culture was introduced around the time when the 茶経 was published in the late Tang Dynasty. At that time, tea was drunk as one of Chinese medical herbs. Unlike to the conventional brewing, fresh or dried tea leaf was dropped into boiling water and drunk. During宋朝, the 点茶 culture was developed and the compacted tea powder that made from either fresh or dried tea leaf was used. The interesting point is that for this tea culture, the equipment by the name of 湯瓶 or 茶瓶 that was used for boiling water had a side-handle. Even at present, the same equipment is used for Chinese Herbs. The 点茶 culture was introduced to Japan by 栄西禅師 (1141-1215) who studied in China and published the book in Japan. Thanks to his book, the tea culture was rapidly developed in Japan. Many Kings encouraged his associate people to learn about tea and also developed many tea wares. In 1600s, the culture Sencha was introduced to Japan by 隠元禅師. With the introduction of sencha culture, tea ware was also introduced from Yi Xing, China. However at that time, it seems Japan already had own manufactured teapot. It was not the tea pot specially designed for Sencha like the Yi Xing 茶壺. The 湯瓶 that was made for 点茶was deeply adapted in Japanese tea culture and used for brewing Sencha. Subsequently the design of Japanese tea pot has further evolved. The design of Yi Xing teapot茶壺 merged with 湯瓶 and became the conventional design of Japanese teapot. The Japanese Teapot is called kyusu 急須, while that teapot from Yi Xing was called cha-hu茶壺. Usually, the side-handle and the outlet is aligned at about 90 degree, however, depending on the artist, the angle is varied. 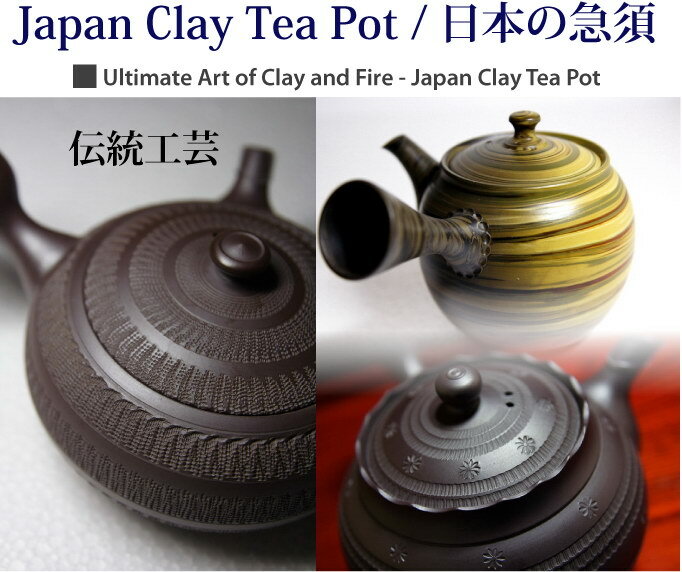 In Japan, there were 4 major places known for the manufacturing of clay teapots: Mie Prefecture(Banko Yaki 萬古焼), Gifu (Onko 温故焼),　Aichi Prefecture (Tokoname Yaki 常滑焼) and Mumyoi Yaki (無名異焼） These 4 areas were located at the center part of Japan. Geographically, all these 4 areas are located along the Japan Median Tectonic Line (JMTL) and Itoigawa-Shizuoka Tectonic Line (ISTL) which is connecting to JMTL. In the history, these places are known to have very active volvanoes. There is no doubt that these areas produce clay with very high minerals content. In year 1859, Ogaki 大垣（岐阜県） started to make the first clay teapot in Japan and named as Onko Yaki: 温故焼. However, it disappeared in the history and up to date, this is no longer exist. The biggest contribution of 温故焼 is the introduction of potter's wheel method: 轆轤 in making a teapot. Initially clay teapot was made by 打身筒 method that was introduced from China. Banko and Tokoname were also influenced and 轆轤 method is still used until today. For Yixing teapot, it is produced of Zisha. I would like to clarify the terminology of Zisha 紫砂(Purple Sand) once again. Zisha refers to crude clay rock that is produced in Yixing. Any clay that is produced outside of Yixing, other part of China included is not called Zisha even if its character is similar or identical. Zisha is the mixture of 3 clays, red clay, purple clay and green clay in general. Different clay has different effect. Each type of clay has a different mineral composition and therefore makes the taste of tea obviously different. Various interactions or sort of ion-exchange reactions occur between the minerals that exist in water and the minerals in the clay. When iron is baked with oxygen, it oxidizes to become Fe3+ (Magnetite). On the other hand, iron becomes Fe2+ (Hematite) when it is baked with less oxygen or without it entirely. With less oxygen, fire generates carbon monoxide. This carbon monoxide will draw oxygen away from the iron. The following picture shows 2 teapots that are produced from the same clay. On the other hand, there are a number of teapot that is made of originally black clay. Those black teapots are mainly dominated by Manganese. The Manganese appears in black when it is baked with oxigen. Usually mannagese does not make taste better. Hence it is important to select teapot not only just based on the color, but also with proper understanding of clay. What is the difference in effect using between artificially mixed clay and natural clay? The natural clay and mixed clay gives a different effect, although they looks visually similar. The iron particle exists in natural red clay is in crystallized iron granule, just like gem stone. Artificially mixed red clay contains added iron which is ground by granulator. The shape of iron particle is very uneven and large surface area due to the hammering by granulator. Usually artificially added iron has very low melting point because of larger surface, which unable the clay to withstand high baking temperature up to >1200 degree C, while the melting point of iron particle in mixed clay is at around 600-800 degree C. Once iron particle get melted during baking, it liquidize and drastically loose the surface area. Nowadays most of red clay teapots both in Japan and China are made from artificially mixed red clay. It is due to the reason that we start forgetting the effect of natural red clay and tends to choose teapot based on the outlook or the fame of the artist. (a)	Rinse the tea pot with normal water. (b)	Put the lid on, and then rinse the tea pot with hot water. (c)	Open the lid, and pour the hot water into the tea pot and thoroughly rinse it. (d)	The tea pot is ready for use. (a)	Use the clay tea pot to brew tea, not as a stove-top kettle. (b)	Do not scrub the tea pot with abrasive pads. (c)	Do not use any detergents. Always rinse it with water only. (d)	Do not leave tea or water in the tea pot for long periods of time. (e)	After finish using the tea pot each time, remove the remaining tea leaves, rinse with water, and then pour in boiling water into the tea pot. After pour out all the hot water, remove the lid and let the remaining heat evaporate any excess water. (f)	To maintain the evenness of its appearance, always wipe the outside with a dry cloth while the tea pot is still warm. The shipping fee to oversea by small air parcel happens to be even cheaper than domestic shipping fee in Japan. For your information, some countries, EU in particular imposes custom duty. We need buyer to bare the duty. We are sorry, but we cannot change the amount on the invoice, and we do not mark any packages as gifts. We will strictly follow the custom regulation.